This post originally appeared on Social Times. Facebook Reactions are finally here. This means people can express actual emotions as opposed to simply ‘liking’ things their friends share. It’s great for individual content, but what does this mean for brands? I took a look. There’s the regular Like, and the new ones are Love, Haha, Wow, Sad and Angry. Don’t forget, you can still only express one emotion per post – you can’t Like and Love. It can be only one of the six. I looked at 10 of the top Facebook posts (engagement score of 1,000 by Unmetric’s scoring system) from Feb 25 – Mar 05, 2016. They were posts from Nissan, Mini Babybel, Bertolli, Windex, LG Mobile, Giorgio Armani Beauty, Arby’s, Rebel’s Market, Little Things.com & US Cellular. 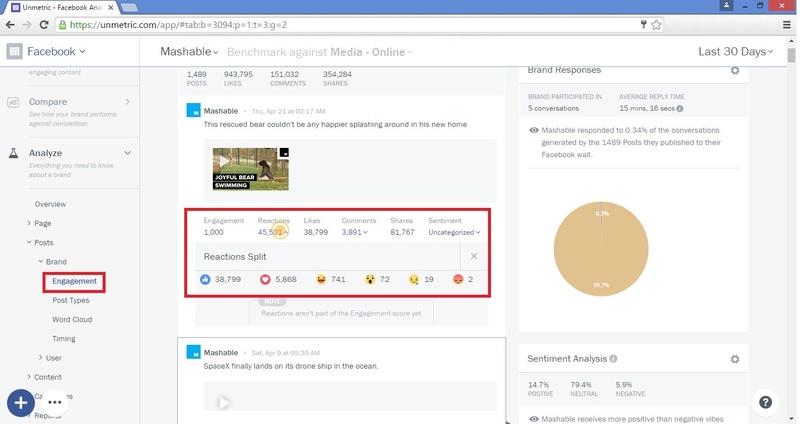 April 27, 2016 – Update: Facebook has made Reactions data available on their API and it can now be accessed within the Unmetric Analyze platform. 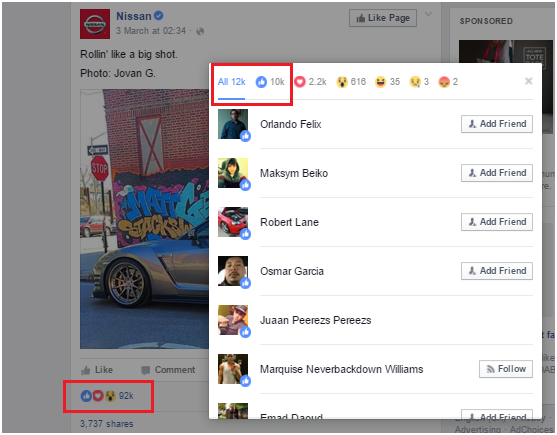 In this post, though Nissan has over 92,000 Likes + Reactions, in the breakdown, Facebook only records 12,000 of the interactions. This happens for all posts that have over 10,000 interactions. For example, while displayed total interaction numbers and breakdown interaction numbers don’t add up for Windex, LG Mobile & Arby’s, there is no major glitch in the numbers for Mini Babybel. Since the numbers for the Reactions seem detailed while only the Likes seem to be rounded up, for the purpose of this article, I’ve assumed the missing numbers are Likes that are not being counted in the display. And to further validate the assumption, I noticed the numbers when I see it on my mobile, are fully accounted for and the missing numbers are Likes! With that (validated) assumption, here is what I found. 93% of all interactions are still Likes. 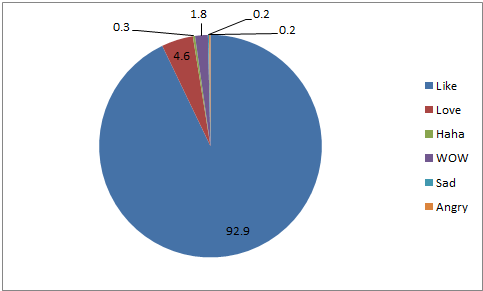 Love is used 4.6% and that’s the second highest. While I begin to doubt if this is because of the order of the Reactions, I’m proven wrong when I see that Wow is used more frequently than Haha. 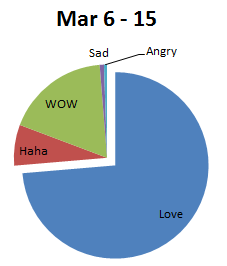 Here is a clearer representation of the Reactions usage exclusively. The extra microsecond effort it takes to hold and swipe to express an emotion could discourage people from using them as opposed to the single click effortless Like. It could also be because of that fact that we’ve been conditioned to ‘liking’ things as opposed to ‘reacting’. There could also be cases like me, where you accidentally ‘react’ when you were simply stalking and didn’t even mean to interact with the post – chubby finger caused engagement is real. Or is it likely that users simply need time to get more familiar with the Reactions? I dug deeper. Using the same methodology as above, I picked 10 of the top most engaging posts in the period of March 6th – 15th, 2016. The top posts are from Frost, Nissan, Hillshire Snacking, Rebel’s Market, Samsung Mobile USA, Philadelphia Cream Cheese, Fresh Step Litter, Disney Cruise Line, IHOP & Portillo’s. 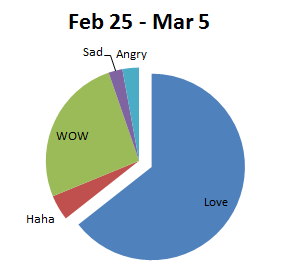 And these are the Reactions usage. While I expected the Reactions to have gained popularity and be used more, there was in fact an increase in the number of Likes and Reactions usage went down. 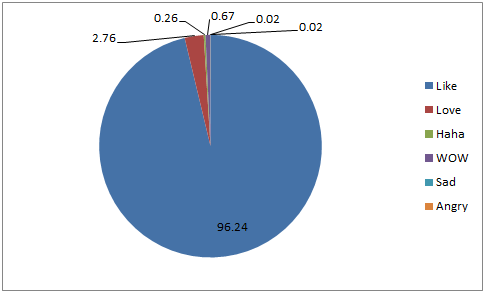 Of course, this could have been due to the unevenness of the samples, but the numbers don’t lie. 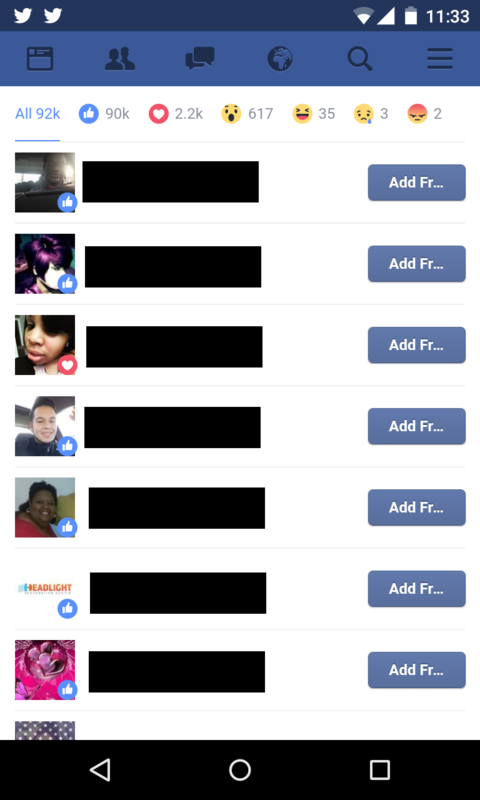 You can get a better idea of how people interact with your posts. The new detail in feedback is great to tweak your content strategy. For brands in the service industry, the ‘Anger Reaction’ is crucial. Don’t be afraid of it. Since Facebook is still treating a Reaction as a Like, even if people express ‘Anger’ they’ll continue to receive your content on their newsfeed. So remember to take the negative reactions a lot more seriously and set up a customer service strategy to tackle any situation that might escalate. Reactions data is only available on a post basis as of now, so you’ll have to individually go into each post to get the breakdown of the reactions or use the Insights>Post page. Contests are already one of the most widely used marketing tools. You can leverage the new reactions to encourage engagement and qualify winners. With reactions, your paid strategy can become more refined. Based on your brand guidelines, detect posts that get the most desirable reactions and promote those. Alternatively, you can also look at posts that are getting negative reactions and look to detect PR crises in advance. In the age of influencer-driven marketing, you can identify fans that give you ‘Love’ most often and engage with them. The most value Facebook Reactions will provide brands is the ability to further uncover the sentiment of your customers and prospects and shift your strategy accordingly. Brands have already started acknowledging reactions and started putting out campaigns completely themed on it. This means your brand needs to start being cognizant of them and start looking for innovative ways to join in on the new big thing in the social universe. 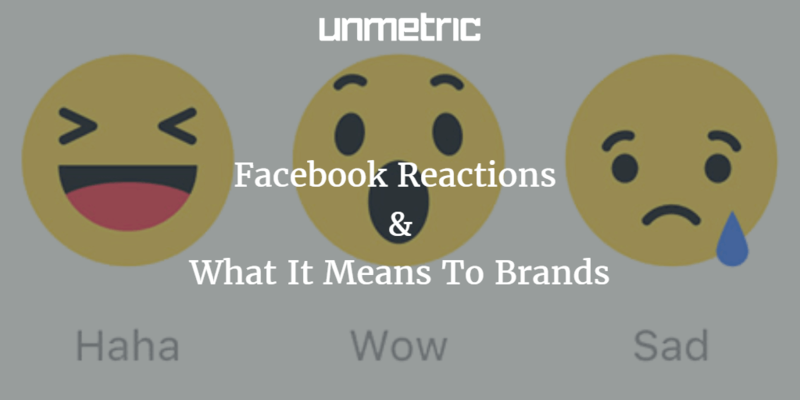 Unmetric customers can now access metrics and get analytics on competitors’ Facebook Reactions with Unmetric Analyze under Facebook > Analyze > Posts > Brand > Engagement. Do you want to access Reactions data as well? Sign up for a free trial using the form below and take a look.